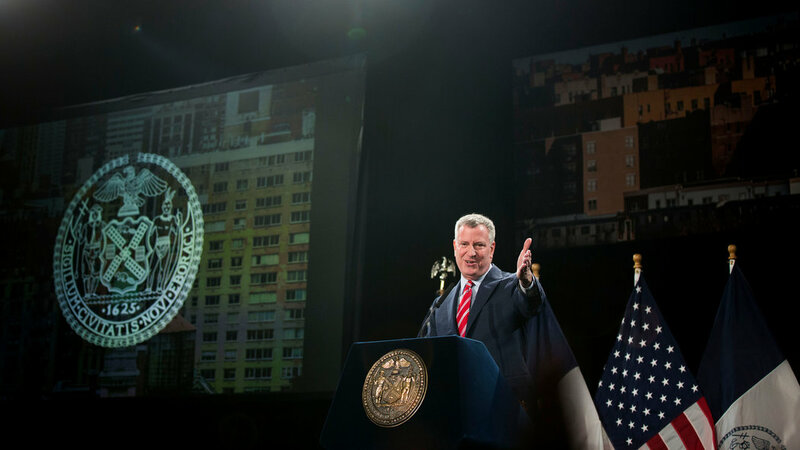 The complete State of the City address of Bill de Blasio, the New York mayor. Photo by Damon Winter/The New York Times. Thank you, Sheryl Morse, for that warm introduction. Thank you to Mitchel Wallerstein for hosting us. Thank you to Officer Leggio, and to Frederick Trapp of the D.S.N.Y. And thank you Rev. Gabriel Salguero. Thank you to my fellow New Yorkers! And of course thank you to the first lady. Anna traded picturesque hillsides, and small town familiarity … for an apartment at 205 East 17th Street in Manhattan, just a short walk from here … a place lacking the tranquil comforts of her childhood … a neighborhood where few spoke her native language. But Anna’s new home offered her something that her old one did not: profound possibilities to create a better life … for herself … and for her children. So, in the year 1910 — a decade before our country granted women the right to vote – Anna opened an embroidery company: The Misses Briganti… its very name a proud symbol of single women – the “Misses” referring to her sister, and her mother, and herself – three women who started the business, together. You can see it all over New York — in the eyes of the single mother in Coney Island, working two jobs and barely scraping together enough for a modest apartment to share with her kids. You can see it in the worn hands of the fast food worker in Washington Heights, consumed with worry as the calendar approaches the first of the month…the day the rent is due. If we do not act — and act boldly — New York risks taking on the qualities of a gated community … A place defined by exclusivity, rather than opportunity. And we cannot let that happen. Over the past two years, I’ve spoken about the need to take dead aim at the Tale of Two Cities, and about our vision for creating One New York, rising together ... a city where everyone has a shot at the middle class. We ended the overuse of stop-and-frisk, reducing stops by over 75 percent. And since we instituted our new marijuana policy, arrests are down almost 65 percent. Our N.Y.P.D. officers helped bring the city’s crime rate to an all-time low – with the smallest number of murders, robberies, and burglaries on record. The F.D.N.Y. responded to a record 1.6 million emergency calls … always at the ready when New Yorkers needed help. We established Vision Zero — bringing pedestrian deaths down to a level not seen since 1910. We handled one of the snowiest winters our city has ever seen, with 11 winter storms in 2014. And after our sanitation workers did an extraordinary job clearing our streets … our Department of Transportation workers filled nearly a half-million potholes. In 2014, we took on climate change and the damage inflicted by the extreme weather linked to it. We helped repair the devastation wrought by Superstorm Sandy – beating even our ambitious goals – with construction starting on more than 1,000 homes; and badly needed reimbursements provided to more than 2,000 homeowners. And today, I want to make perfectly clear that every reimbursement check will be in the hands of those who need them by the end of this year. From Staten Island to Canarsie to the Rockaways, families hit by the storm have been through so much. This Administration will finish the job of helping them rebuild. In 2014, we balanced our budget in a way that was honest, responsible, and in keeping with our progressive values. We came to contract agreements with over 71 percent of the city’s work force, up from zero the year before – signing deals that are fair to both our city workers and to our taxpayers. We awarded $690 million in contracts to minority and women-owned businesses, a 57 percent increase from the year before. We created the Tech Talent Pipeline to link New Yorkers from every borough and background to a booming tech industry that now employs nearly 300,000 people, and is growing every day in our city. We invested capital in new economic hubs to create 3,000 new jobs in the Brooklyn Navy Yard and 1,000 new jobs at the Brooklyn Army Terminal that will be there for years to come. We announced our plan to redesign our work force development system to arm up to 30,000 New Yorkers a year with the skills for 21st century jobs. We ended a ticket blitz on our small businesses, and are on track to save them $5 million in petty fines — money they can put towards growing and hiring. With the help of the City Council, we created IDNYC – for both citizens and undocumented New Yorkers. Let’s be clear: Relegating any New Yorker to life in the shadows is not who we are as a city. And I’m happy to report that — less than a month after this program’s inception — more than 180,000 New Yorkers have already made an appointment to get their ID. And we began a major new effort – now led by our inspiring first lady — to address the gaps in mental health coverage in New York City. This issue is personal to Chirlane and me, and to so many families who’ve watched loved ones fall through the cracks of an inadequate system. I can’t think of a smarter, stronger, more compassionate person to lead our effort to change that than our first lady. Let’s thank her! We’ve begun to create 128 community schools – schools that serve the whole child … offering everything from vision tests and mental health screenings … to family counseling and tutoring. We created 62 prose schools – a fresh, new model where teachers and principals work together to set aside D.O.E. and union rules that hinder innovation … so we can better serve our kids. And we invested in Renewal Schools … to fix 94 struggling schools … because every child in every neighborhood deserves a quality education. While the state of our city is strong, we face a profound challenge. If we fail to be a city for everyone, we risk losing what makes New York … New York. And nothing more clearly expresses the inequality gap … the opportunity gap…than the soaring cost of housing. Now spending more than 30 percent of your income on housing means you’re officially “rent-burdened.” That’s an apt description, since the cost of living is becoming a heavier and heavier burden — not just on wallets, but on hopes and aspirations, as well. Part of the problem is that the city has for decades let developers write their own rules when it came to building housing. Sometimes projects included affordable housing … but far too often, they did not. That meant a bias towards luxury housing – units that fetched top dollar, but were entirely out of reach for most New Yorkers … multimillion-dollar homes that drove up rents in the neighborhoods they occupied – all without a corresponding menu of affordable new options. This administration is taking a fundamentally different approach – one that not only recognizes the need for more affordable housing…but demands it. First, we’re writing new rules … ones that mandate affordable housing as a condition of development in areas rezoned for residential use. And third — since we only have so much land — we’ll create more affordable housing by literally building up … adding density to appropriate parts of our city. And as we invest in more affordable housing, we will also work with communities to preserve the fabric of neighborhoods and invest in things that great neighborhoods need — from parks and schools…to shops and restaurants. Now, there are some places in our city that have not yet been developed or zoned for housing, but could be. And by taking steps like adding residential buildings to former manufacturing sites — or adding some six to eight story buildings in appropriate places — we could make a fundamental difference in neighborhoods’ affordability. That means families staying and thriving in the neighborhoods they love, instead of being priced out. Will this be difficult? Of course. But let me remind you of a difficult challenge we overcame just last year. Of all the efforts we made in 2014 to address income inequality, the most prominent was our successful bid to secure universal, full-day pre-k – something bold and meaningful … and something that so many pundits said we couldn’t achieve. The naysayers said we would never find the funding … or the space … to give all our kids a chance. In fact, we’re already doing so … already making real progress towards a more affordable New York. Second, we are following through on a plan to build and preserve affordable housing on an unprecedented scale. We’ve committed to the construction of 80,000 new units of affordable housing by 2024. Let me put that in perspective: It means building new affordable units at twice the average annual rate of the past 25 years. When you add that to the 120,000 units that our plan preserves, it means affordable housing for a half million New Yorkers … more than the entire population of the city of Miami. Take that, Miami! This is what our housing plan does. It’s real. Those here … can pick up a copy. And anyone can read it online at NYC.gov. And we’re already putting this plan into action. Our goal for 2014 was to create and preserve 16,000 units. We beat that goal — achieving 17,300 affordable units last year alone. Third, because it’s been projected that New York City will be home to nine million people by 2040, we’re pursuing every kind of housing. Increasing the overall supply of housing is critical to serving New Yorkers at all income levels — and to assuring we can accommodate the work force who will continue to grow our economy. Fifth — for the first time in New York City history, we are creating a Mandatory Inclusionary Zoning requirement that will apply to all major residential rezonings. Want to see this approach in action? Look at Astoria Cove in Queens. As a result of this Administration’s framework — and the City Council’s tough negotiations — 465 units of affordable housing will be created at this site alone. That’s 465 families who no longer have to choose between living in the city they call home, or finding another city they can afford. It means that hundreds of kids will live and learn and grow in our city. Astoria Cove is a site in which previous City rezoning policy wouldn’t have required any units of affordable housing. Zero. That was, in fact, the original plan. So if you want to see the difference that our approach is already making – it’s the difference between 465 ... and zero … on one site alone. And there are many more rezonings like this coming soon to neighborhoods across the five boroughs – from East New York to Long Island City; from Flushing West to East Harlem; from downtown Staten Island to the Jerome Avenue Corridor in the Bronx. Right now, there are 200 acres of land in the heart of Queens, land that exists in the form of a rail yard – and only a rail yard. But the fact is, those tracks could easily exist underground – allowing us to build housing – much of it affordable — above them. At Sunnyside Yards, we envision a plan that incorporates what diverse and dynamic neighborhoods need — access to transportation, parks, schools, retail stores, and job opportunities. Now 200 acres is a lot of land. We know some parts of this site can easily handle larger buildings… and others can’t. So we’ll work closely with elected officials and community leaders to determine what makes sense. Our approach is not entirely novel. Developments that prioritize affordability and livability HAVE been built before — from Starrett City to Co-op City to Stuy Town, to the Big 6 towers in Woodside, Queens. Stuy Town, when it opened in 1947 provided our city with 11,250 affordable apartments… a community where trees and parks, and shops dotted a landscape from which residents could actually see the sky. We’re bringing that same kind of scale — and a real sense of urgency — to Sunnyside Yards … and setting the same exact goal of 11,250 affordable units, as part of a neighborhood that anyone would be proud to call home. To paraphrase one of my former employers, it takes a village to build a neighborhood. So we look forward to partnering with Amtrak and the M.T.A. in this extraordinary effort at Sunnyside Yards. With a $200 million capital investment, we can stimulate the development of 4,000 new units of housing – much of it affordable — and provide the parks, schools, and commercial development that support a growing, thriving population. Our plan will jump-start the process of acquiring underutilized properties in the Rockaways – areas blighted or vacant for decades – as we look to create new, affordable housing for thousands there. We must also remember that transportation is central to the mission of providing affordable housing and services — connecting neighborhoods in the five boroughs to New York’s largest job centers. Today, if you live in one of those neighborhoods – the Rockaways or Red Hook or Soundview, among others — a job in Manhattan can easily mean an hour or more of commuting, even when the skyline is visible from your home. You can actually see opportunity, but practically speaking, it’s very far away. Today, we announce that we’re launching a new citywide ferry service to be open for business in 2017. New ferry rides will be priced the same as a MetroCard fare, so ferries will be as affordable to everyday New Yorkers as our subways and buses. … so residents of the Rockaways and Red Hook and Soundview will now be closer to the opportunities they need. We will also expand Bus Rapid Transit – or B.R.T. – serving 400,000 New Yorkers along key thoroughfares like Utica Avenue in Brooklyn, and Woodhaven Boulevard in Queens … completing a network of 20 routes over the next four years. BRT will cut transit time on existing routes by 15-25 percent. That means New Yorkers spending less time in transit and more time living their lives. So we’ll provide 1500 units of affordable live/work housing for the artists and musicians who make New York culture so vibrant …. as well as 500 dedicated affordable workspaces for the cultural community. These folks bring joy to everyday New Yorkers; and inspire young people to pursue their natural talents in professions that often don’t promise a big paycheck. They also help make our city a mecca for tourists, and are one of the reasons why a record number of people — 56.4 million — visited New York last year. After two decades of steadily declining crime, people are excited to come to New York … about investing in our city. With that influx of people and resources comes jobs and amenities ... more activity … safer streets. The problem comes when we reach the tipping point … when New Yorkers get priced out of their own neighborhoods. You see, New York City’s last 20 years has had its share of bad actors. First, there are the slumlords – the folks who refuse to make repairs … letting housing decay … making apartments uninhabitable. These predatory landlords harass tenants by, say, intermittently turning off the heat or hot water, or by refusing to address simple matters of safety or sanitation. That doesn’t just violate the law; it violates our values as New Yorkers. And we have tools to address these things. When I was public advocate, we published the Worst Landlords Watchlist – targeting those who refused to make simple repairs to the units they controlled. It helped spur change, with hundreds of buildings coming off the list after making needed improvements … and thousands of tenants getting the repairs they needed. I applaud Public Advocate Tish James for energetically continuing this effort. Albany has responsibility for enforcing our rent laws, but too often that doesn’t happen. We need Albany to step up and enforce the laws aggressively. Now. Every day in this city, people are losing their homes unfairly. Albany cannot wait — we need help right now. And we need stronger rent regulations that reflect today’s New York. To preserve our city as a place for everyone, we need to do more than ever to protect the one million rent-regulated apartments in New York. For so many, it’s the only way they make ends meet … and the only path to the middle class. If they cannot do that, then we call on the State to provide the funding to help tenants … help themselves – by providing free legal services to victims of landlord neglect or harassment. So today, I’m announcing that in any of the areas in which the city rezones, if we find evidence that tenants are being harassed, we will supply those tenants with legal representation, at no cost, to take their case to Housing Court … to seek justice before a judge. Now Albany’s shown some promising signs on this subject – but for it to be more than just talk — and to have a real impact on the lives of those living in New York City – we need more. The current minimum wage proposal simply doesn’t do enough to help New York City. That’s why WE will fight to raise New York City’s minimum wage to more than $13 per hour in 2016 … while indexing the minimum wage, which would bring us to a projected $15 per hour by 2019. It’s difficult to overstate the positive impact this would have on working New Yorkers. Even for those that earn more than minimum right now, this action would create an upward pull on wages ... an upward pull on opportunity…. and an upward pull on our economy. Indeed, Henry Ford – the noted left-wing “socialist” that he was – wanted the workers on his assembly line to be able to afford to purchase the cars they worked to build. So he gave them a living wage. It won’t be easy. And we know there will be critics who say it just can’t be done… that our destiny is to be a city for The Privileged Few … not a city for all. But New York is no stranger to facing big challenges — and the many doubting Thomases — and knows how to overcome them. In fact, we revel in proving them wrong. But we know now that Koch’s plan was realistic… in fact, it worked. And it had a transcendent impact on our city. A city that was struggling and shrinking when Koch took office … turned around. We will not lose sight of why our city is a beacon for so many. It’s not the cleanest place, nor the most tranquil. We don’t have the best weather or many alluring natural landmarks. But we have something special, something unique: an idea at our core – a promise – that ours is a city … for everyone. We are charged in our time with the sacred duty of keeping that promise … and we will not sit idle in the face of crisis. Your resolve compels us to move forward. And, so – my fellow New Yorkers — let’s get to work. Now.